What do trout and maple syrup have in common? They’re the ingredients for a very successful Frost Valley YMCA Volunteer Weekend thanks to the Cadet Fly Fishing Club from the United States Military Academy at West Point, NY. In 2004, Lieutenant Colonel Ronald Hasz visited Frost Valley’s East Valley Ranch for a trip with the club. They had a phenomenal time fly-fishing on the East Branch of the Neversink River in the scenic Catskill Mountains. So, when it came time to plan a spring fishing trip, LTC Hasz had a vested interest in returning with the cadets. It was as though the stars aligned. Ron was browsing Frost Valley’s spring calendar and saw that Frost Valley would be hosting a Volunteer Weekend on April 20-22, 2018, which was a perfect time for a trip. Since they already had a great experience fishing at Frost Valley in the past, they were excited to give back, and it would also keep the costs of the trip down for the club. “The Volunteer Weekend perfectly met all of our needs and goals,” Ron described. As luck would have it, Frost Valley had a very important project that needed to be completed and the cadets were a great fit for the job. Anthony Kordziel, Natural Resource Director, and Dan DeChellis, Environmental Science and Natural Resource Coordinator, knew just how to utilize these exceptionally capable volunteers. “When I told the staff that I had eight physically fit, college-age cadets, along with two club mentors, myself, and my family that could help out, Anthony and Dan came up with a great project for us that didn’t require any technical training,” said Ron. “Our project was to hike through the woods, disconnecting the tubing and metal tension wire for the maple sugar operation. We carried it down to the parking lot for removal,” he described. Frost Valley has a maple sugaring operation consisting of nearly 1,200 tapped trees, along with all the associated tubing to get the sap from the trees to the sugar house. Frost Valley is currently in in the process of updating the 15-year-old gravity based system to a new vacuum pump system. The tubes had become clogged in places, and the layout of the tubing system was outdated for the new vacuum pump technology, making it necessary to replace them. Dan and Anthony took the time to not only explain the project, but also the entire maple sugaring process to the cadets, some of whom were from the south and had never heard of maple sugaring before. They found it all fascinating — the tour of the maple sugar house, as well as learning everything about sap collection and producing the finished product — delicious maple syrup. The work they completed will allow countless Frost Valley guests and campers to learn how maple syrup is made. 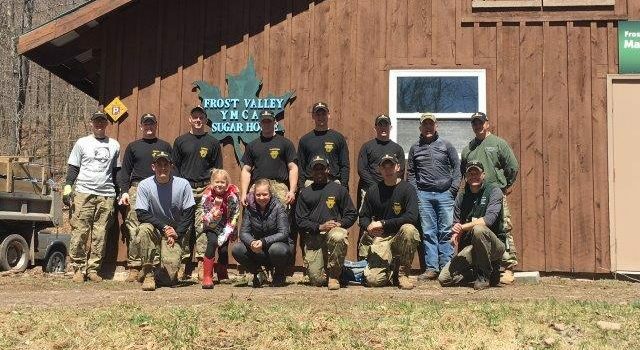 Frost Valley is honored to have the help of the USMA Cadet Fly Fishing Club in addition to the many individuals, families, and service groups that help during Volunteer Weekends, as well as throughout the year. This story originally appeared in Frost Valley’s 2017-2018 Annual Report. Find more great stories in this issue.